That’s the opening line of A year in Google blogging, then it lists the number of posts, products unveiled, acquisitions ..etc. There is one number remarkably missing: the number of comments. I wanted to ask about this in a comment, but I couldn’t. The Google Blog does not allow commenting. . They claim they love feedback: but the only way to leave feedback is by emailing them. Hm, not much of “love” here, if you ask me. I’m sorry, Google, you have Blogger, but until you open up commenting, you don’t have a Google Blog. Update #2: Mike at TechCrunch agrees, in fact he’s running a poll on the issue – worth checking a little later. The cached version is time-stamped 5:18pm, while the current blog post has 4:23pm, so the earlier version appears to be live … go figure. In the end, it really does not matter, what’s important is that the Googlers agree to bring the conversation on. “- Each project at Google should monitor the blogosphere for issues. Reduce the disconnect to reduce the danger. Blogging crew or not, let Googlers volunteer on the Google Blog. I’m sure we’ll have a lively conversation. Update (01/02): Amazingly this is the third day in a row this discussion lives on TechMeme …. “You can’t turn off the comments and have a truly interactive blog with a community. Comments are where it’s at in blogging. If I turned off comments, I’d quit blogging. I couldn’t agree more. Unfortunately we’re seeing examples of just the opposite, like Marc Andreessen whose otherwise excellent blog is now commentless, or Zooomr, who simply turned off comments to redirect the conversation to their internal groups. German student wants to see his girlfriend in Sydney (of course the one in Australia) and finds himself on route to Sidney, Montana. Unbelievable… read it on CNN. I’ve just warned Ben Casnocha (comment) to make sure he does not end up in the wrong Boulder, and now I’m reading about Vinnie flying over Buda, TX. Vinnie, what are you doing there? You’re in the wrong Buda! Is anyone else getting this junk all over their feed reader? The WordPress test post is dated Oct 26th, but for the past two days it shows up randomly in just about any Attensa folder… I can’t keep up deleting it. Update (2/5): Well, whatever it is, whoever they are, just got acquired. Congrat’s ( I guess?). Update (12/30): Steve Rubel’s New Year Resolution is to highlight new voices. So.. is that the … R-list? According to Yahoo the Fiji military coup just happened, Saddam probably has a few more weeks to live, and we won’t be ringing in 2007 for a few more weeks. Or is this already the “2006 in retrospect” site? A TechCrunch commenter pointed out that the amount the RIAA sued Russia-based AllofMP3, $1.65 trillion (!) is actually more than Russia’s GDP. Isn’t that outrageous? I am probably not the right target customer for ProfileLinker, I admit I don’t even have a MySpace of Facebook profile. But I do have one on LinkedIn, and was invited to several networks whose function I’d find useful, except that I won’t take the time to create a profile from scratch again and again. What I (and I suspect most networkers) badly need is a way to leverage the already existing profile and network (friends) information on other sites – probably by using a “central depository” of such information. Who cares about ProfileLinker, give me ProfileCentral! PayPal is inviting selected users to test their virtual debit card program. It certainly make sense, but I find it funny that it’s beeing heralded as new. Like I’ve said before, “I only ever use throwaway, virtual credit card numbers on the Net, so scammers can bill all they want, they can’t charge my card” – that’s a service by CitiBank, and I’ve been enjoying it for at least five years. 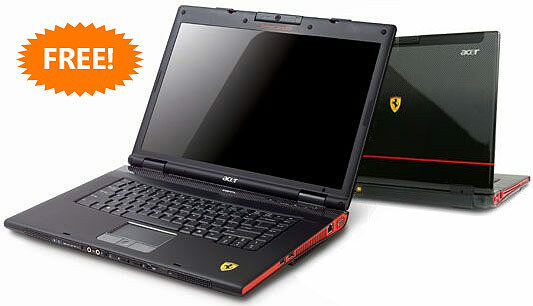 Microsoft is sending Acer Ferraris loaded with Vista to selected bloggers. That’s not the first thought that comes to my mind though… try this: despite the underrated system requirements, you’ll need at least a Ferrari for VIsta to even chug along. on second thought … MERRY CHRISTMAS!